As I joined the circle of people, I remained acutely aware of Stone Woman sitting nearby. Holding her in my hands had awakened something inside me. It had kindled a spark of desire. The next morning that spark burst into flame. I dashed over to Harmony Center intent on communing with rocks resting here and there behind the building. My body wanted to hold them and see whether or not they would like being placed one on top of the other. Standing next to a large rock, I recalled what I’d learned from Loralee Dubeau* when we prepared for her Medicine Wheel class. She and I walked around the land selecting rocks to be used in the ritual. Reminding me that rocks are sentient beings, Loralee instructed me to check in with each rock before lifting it up. If the rock resisted being lifted, we left it where it was. I looked at the bluish rock, and asked if it would like to have some relatives placed on top. Perceiving what I took to be “yes,” I looked around. My eyes scanned nearby rocks, seeking to discern which one would offer itself, and stopped at a dark, oblong, granite-colored stone. Feeling as though the dark stone had called, I walked over, picked it up, and carried it toward the blush one. My hands and eyes processed messages from the rocks. Somehow I “knew” that these two were O.K. with being placed together. I balanced the dark stone atop the bluish one, then looked around until a mottled rock grabbed my attention. Totally focused on listening to rocks, and following their wishes, I lost myself in the process. I feverishly created one cairn after another, and another, and another. Soon there were cairns gathered here and there behind Harmony Center. Eventually my inner flame dimmed, my energy slowed. I stood back, breathed in the scent of rock and earth, and sensed it was time to stop. 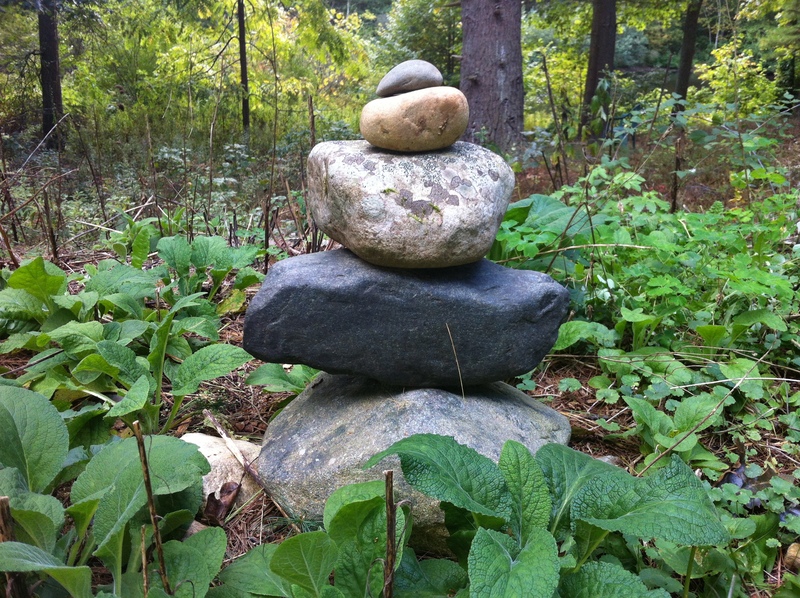 Today as I sit near the pond, I spot some stones nearby and sense myself responding in a new way. I notice that my relationship with stones has shifted. I’ve begun to experience them as sentient beings. Although I used to believe in this notion, I realize that creating the cairns awakened a new knowing inside me. Dormant senses came alive. As my hands and eyes deeply connected with various rocks, inner sensory “organs” opened. Messages travelled back and forth as hands and eyes found ways of communicating with rocks. When I now connect with a rock, I sense its being-ness. I see its uniqueness, and can almost hear it speaking to me. Recognizing this new sensitivity, I send a mental “thank you” to the cairns. They expanded my awareness and helped me to grow. 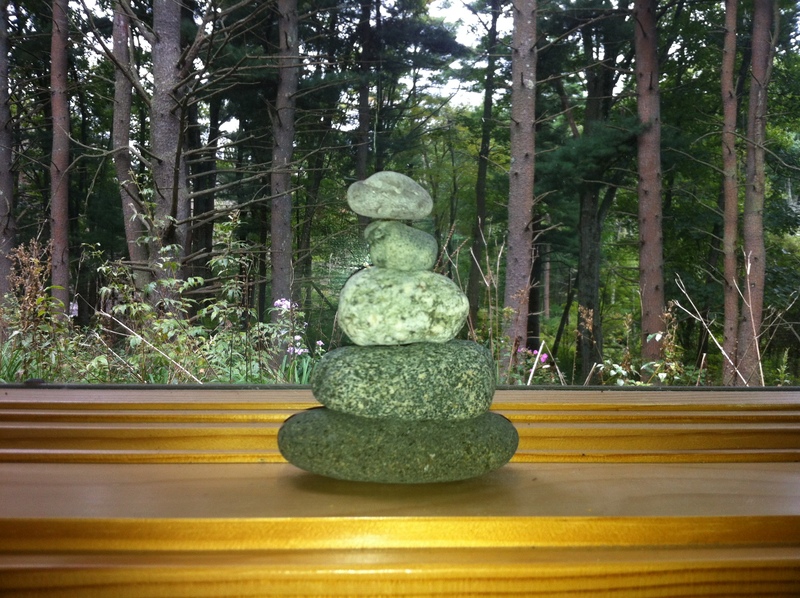 Cairn’s calm strength, inner depth, and sense of balance live inside me. This is really beautiful Leslie…I am there with you and the cairns and feel their power and truths. Wonderful! I really resonate with the cairn you put together from your land. thanks for sharing this. Yes! You said it so eloquently. More and more of us, perhaps, are learning ( remembering , really) that stones are alive, that all things in the natural world have life energy. They are wise, those slow-moving ones, and they have much to teach us.